Enchanting Magnolia and Wild fig, is an elegant fusion of subtleness and passion. The delicate aroma of magnolia embraces body and rich fragrance of wild fig relaxes nerves and brings calmness to breath. 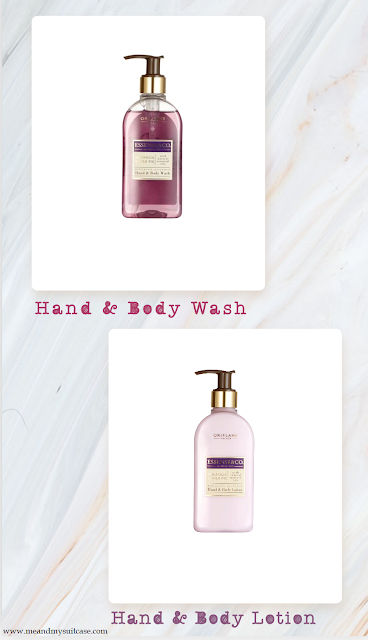 The lovely purple color of hand & body wash and the white colored hand & body lotion brings the royal feel to this personal care product. I am loving the smoothness it brings to my skin and keep it moisturized & healthy. This fresh floral scented hand and body wash hydrates & cleanse skin and acts as a light perfume on body. Ideally to be used after Magnolia & Wild Fig Hand & Body Wash, this moisturizing hand and body lotion is blended with natural essential oils to luxuriously pamper and delicately perfume your skin. It is relaxing, make you feel fresh and happy. Added benefit: It is non-greasy and easily absorbed on skin and use it daily and in combination for better results. It is dermatologically tested, moisture-rich and gentle enough to use every day for soft and supple skin. Verdict: Little medium to high priced but considering its result you should go for it.